Ultrix 12G Router is the ultimate routing, multiviewer, and signal processing platform for Studios, OB Vans, and Flypacks. As the only software defined platform, customers realize significant cost, space, and power efficiencies with unparalleled flexibility and agility, especially relative to competitive hybrid routers. Easily add new features through additional software licenses. No additional hardware required. 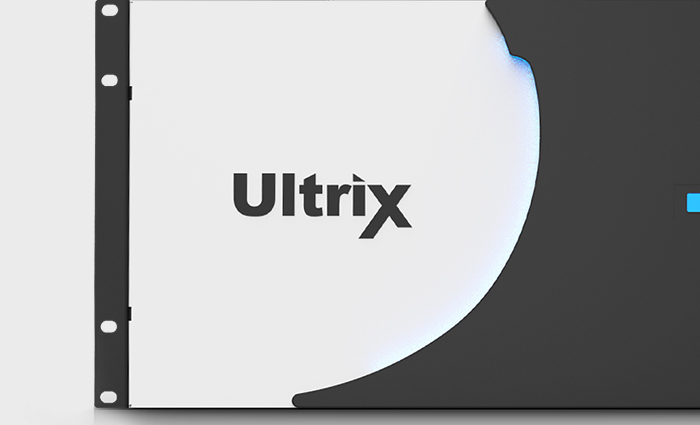 Ultrix natively supports 12G throughout the entire chassis. This means it’s ready for UHD production when you are, without replacing any hardware or losing capacity. New version of the latest Ultrix-FR5 routing/AV processing platform that adds IP I/O to the already impressive feature set of this disruptive, ‘Swiss Army knife’ infrastructure solution. The Ultrix 12G Router is infrastructure in a box. Video/audio routing, multiviewers, audio processing, frame synchronizers, clean/quiet switching, UHD gearboxing and more all unified in one single chassis. Because of its size, base feature set, and software capabilities, owners save significant money on upfront capital costs. Additionally, the advanced architecture provides significant ROI in terms of power, cooling, shipping, and space costs. The software defined architecture means you simply buy what you need, when you need it. No need to make critical design decisions upfront, simply add appropriate functions when they are required. The Ultrix 12G Router provides a compact and powerful combination of routing, multi-viewers, audio processing, and control, without requiring special hardware as advanced features can be added at any time via simple software licensing. Up to 3kx3k audio routing and processing fabric comes standard with Ultrix. Up to 2kx2k embedded, and 1kx1k discrete audio supported. Route, process, and configure down to a mono channel, regardless of I/O. The multiple patent awarded hardware design is based on attention to little details. From the sophisticated thermal management, locking card guides and edge connections, advanced internal smart fabric and more, Ultrix 12G Router has been designed to perform in the harshest environments. The ability to change and update functionality via software license translates to significant cost, space, and power efficiencies with unprecedented flexibility and agility. 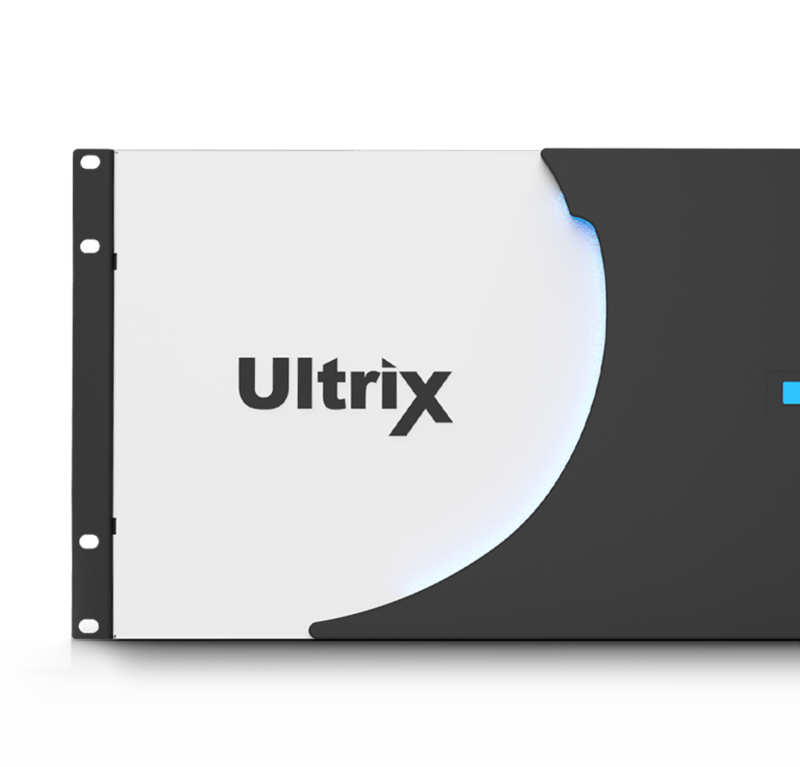 Ultrix platforms are built with a modular input and output matrix, to easily swap in unique I/O cards that build upon the Ultrix feature set. All these cards are compatible with each other on a single chassis and allow you to customize your Ultrix Connectivity Platform to serve as a hybrid-IP switcher, a signal-processing hub, or a 12G-capable Router, Multiviewer, and Signal Processing Platform. Full TDM audio processing standard– Deembed up to 16 channels of audio on every video input, embed up to 16 channels of audio on every output. In addition, discrete audio is available via MADI. Route, adjust gain, adjacent channel sum, invert, and tone insertion on outputs, all down to a mono channel level. Clean/Quiet Switching on Every outputstandard– Every output on Ultrix supports the ability to do true, glitch free/pop free clean/quiet switching. Simply enable on the outputs that require that functionality. 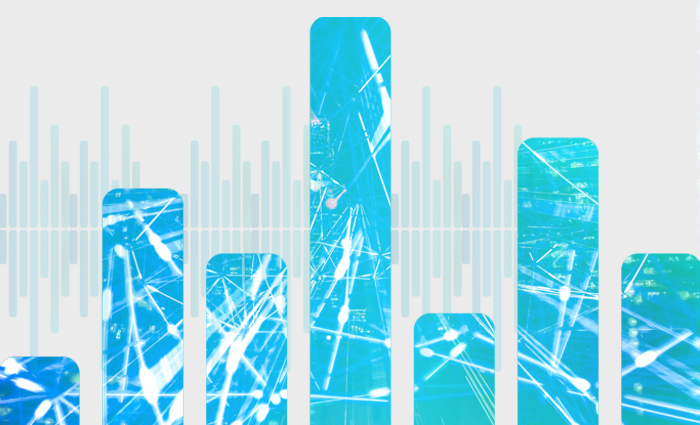 Enhance performance via Software Licensing– Add framesyncs (Up to 3G) on every input. 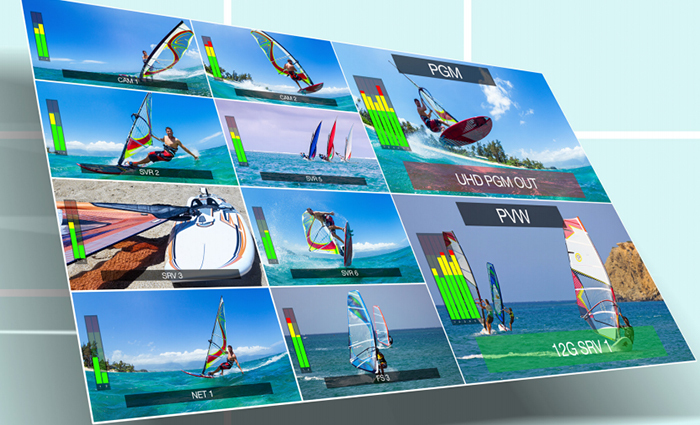 Add Multiviewer capability on up to three Outputs per board. All this simply by purchasing the appropriate licenses. No new hardware or special crosspoints required. Hybrid,SDI or IP, build what you need– With the addition of Ultrix- IP cards, you don’t need to choose between an SDI or IP platform, Ultrix does both. This card provides IP connectivity in addition to the standard SDI count of the Ultrix-HDB-IO card to allow you to build or migrate what you need, when you need it. 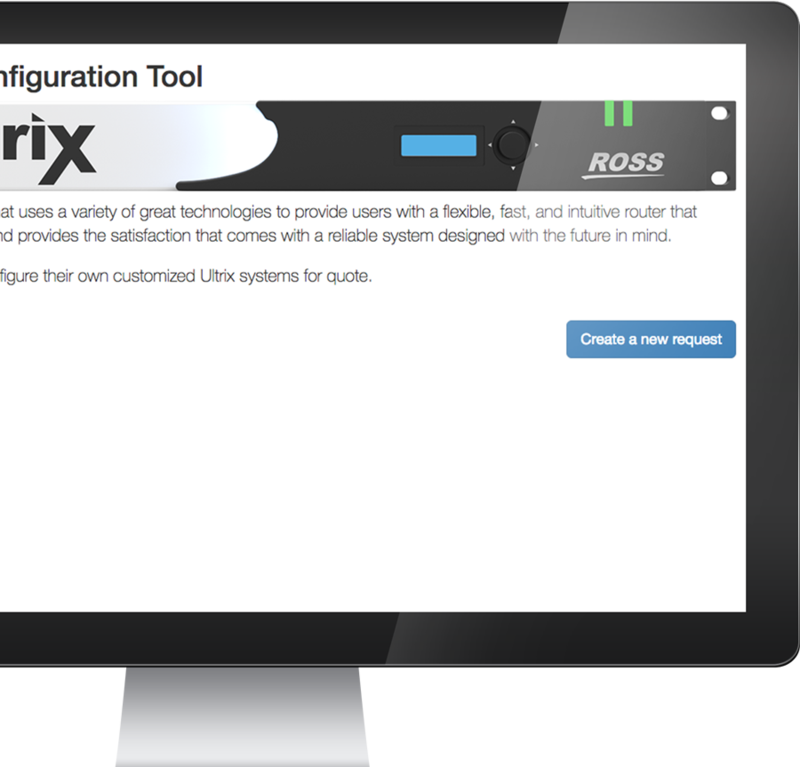 A simple way to customize and quote your Ultrix Routing System. A place for online self-directed learning of Ultrix software and features.